Last year, before I went to Hawaii with my husband, we decided that when we were in Honolulu, we’d make our way to the famous Rainbow Drive-In. I used to hear other people say that they couldn’t go to Oahu without making a stop at Rainbow Drive-In. And then there were comments made by those who were born in raised in Honolulu and then moved away who say that Rainbow Drive-In is their first stop when they land at the airport. There must be something to this place for people to make comments like that. It wasn’t until my husband and I stopped in for breakfast last year that we understood exactly what people were talking about. It was one of those meals that we would find ourselves reminiscing over months later when we discussed Hawaii. So, when it was decided we’d be taking a family trip back to Hawaii this year and we’d have a few days on the island of Oahu, I told my husband that even if no one else was interested in going, he and I were going to have breakfast at Rainbow Drive-In. He wholeheartedly agreed as he was looking forward to it as much as I was. As it turns out, we had no idea whether or not anyone else in the family was interested in dining at Rainbow Drive-In, but we decided to drag them down there anyways. We figured, at the very least, we’d get our breakfast in, and they could just sit there and enjoy if they weren’t interested in breakfast. Hey, we had to get our fix somehow. Even when we pulled into the parking lot for breakfast at 9 am, the place was already bustling with a quite a few people in line to order their food at the window. 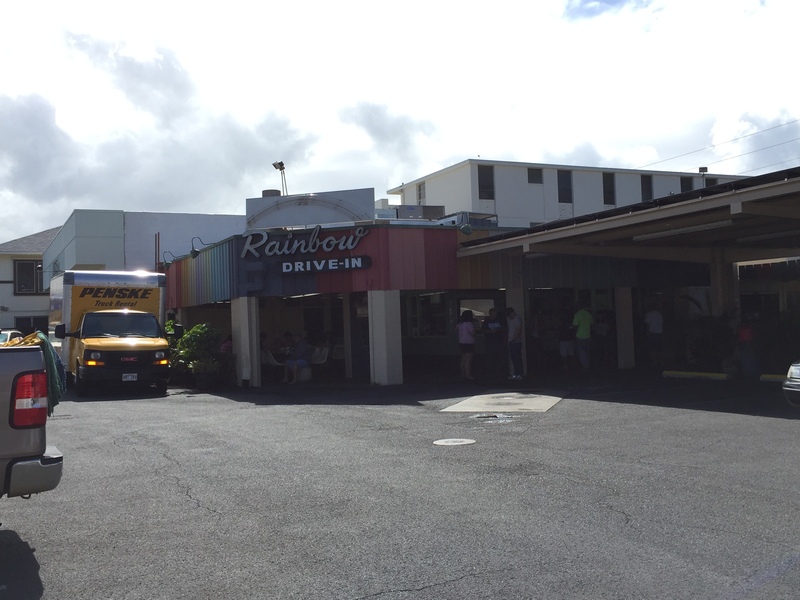 Ah, Rainbow Drive-In, Hawaiian comfort food at its finest. My husband and I didn’t even have to look at the menu, we already knew what we wanted to order. First off, I just had to get my hands on a slush. I don’t know what’s in them, but honestly, they are delicious, refreshing and addictive. Last year, I made the mistake of being a regular-sized slush and splitting it with my husband. I knew I should have gotten my own before we left. And I regretted it the rest of the day because it was so good, especially since that was such a warm day. This time, I told my husband we were getting our own because I didn’t want to share. Ok, so in the end I didn’t get my own, but my husband said that we could get the large slush and split that instead since I’d be drinking most of it anyway. Ok, that works for me. Who needs coffee at 9 am when you can have a slush instead! 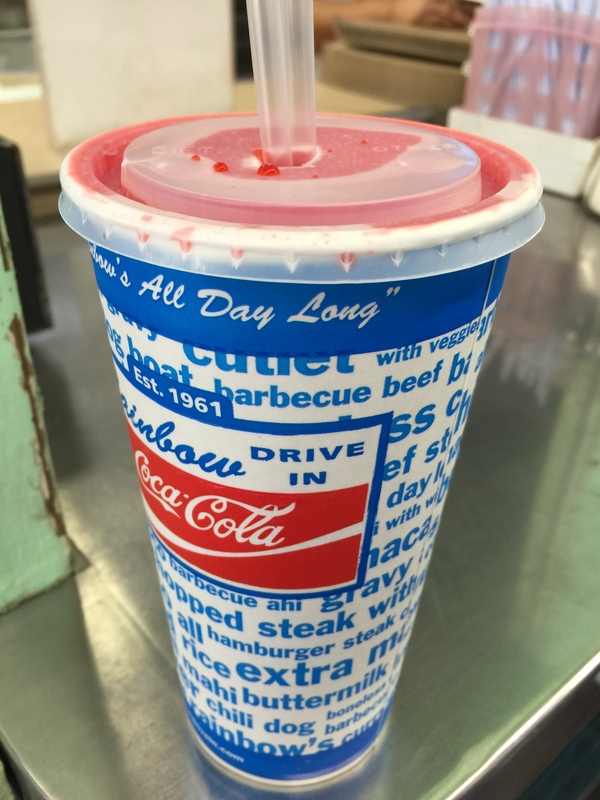 If I could have bought a gallon of that slush to take with me to drink all day long, I would have. It’s seriously that good. I think my husband thinks I’m crazy, but I found the slush to be amazing. For breakfast, there was no question as to what my husband and I would be ordering, the loco moco. However, we got two different versions of the same thing. 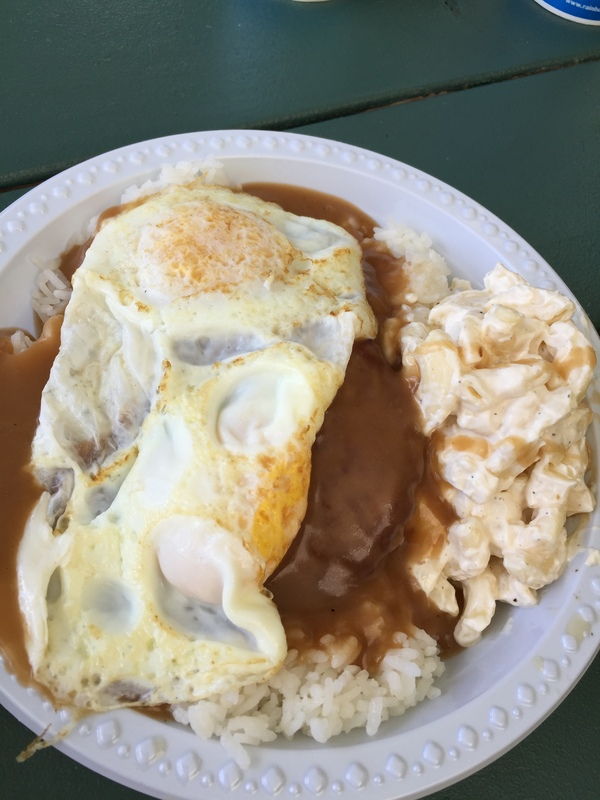 I ordered the loco moco bowl, which is one scoop of rice, one hamburger patty with gravy and one egg any way you like it. Of course, what other way to order the egg than sunny side up? 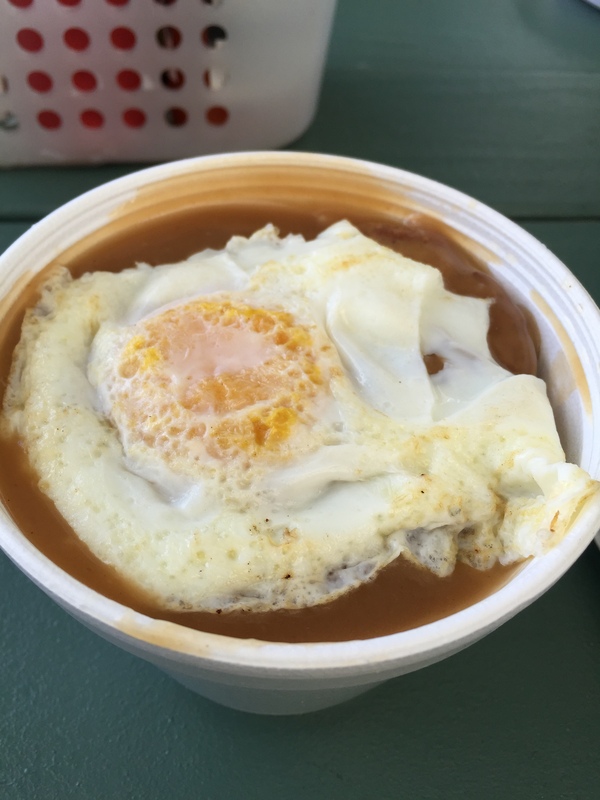 Crack open the egg and watch the creamy egg yolk ooze all into the gravy and over the rice makes it just that much richer and more delicious. This smaller bowl was perfect for me and hit the spot perfectly for a nice, filling breakfast. My husband wanted the loco moco plate which is two scoops of rice, two hamburger patties with gravy, two eggs any way you want them and then a scoop of macaroni salad. Now this, right here, is the ultimate Hawaiian comfort food, especially with the macaroni salad. And since my husband is a huge lover of macaroni salad, this meal is absolutely perfect for him. Sunny side up eggs is also how my husband chose to have his eggs cooked. He and I think alike. My brother-in-law decided to give the loco moco, which he’d never tried before, a go as well. 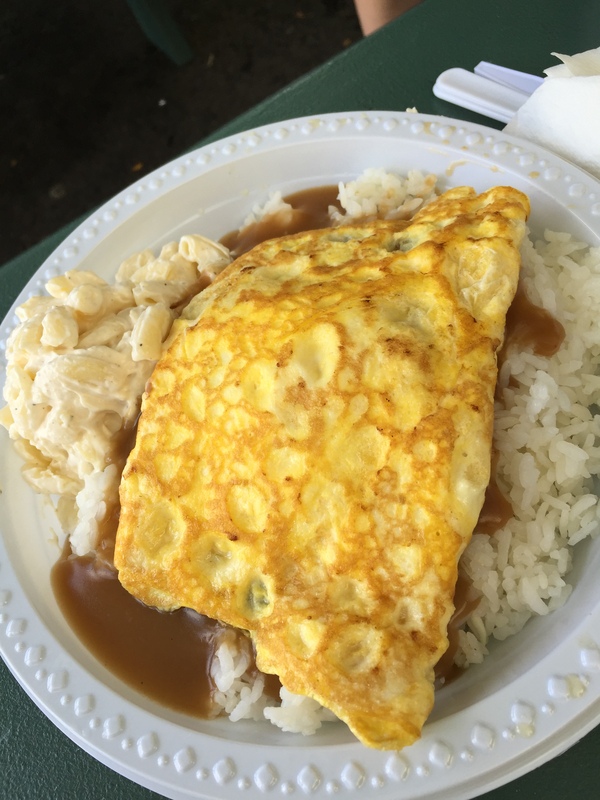 He got the loco moco plate, but asked for his eggs scrambled. He’s definitely not a fan of the runny yolk. I’m not sure my brother-in-law liked the combination of the eggs and the hamburger patty and the gravy and the rice. Instead of kind of mixing everything together, he ate it in a more compartmentalized fashion by eating each item separately on its own. 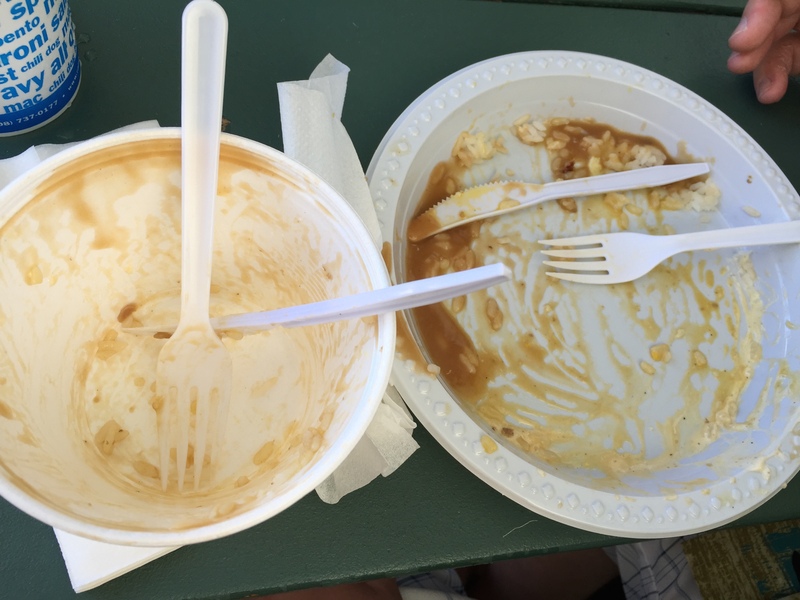 You can see the evidence of how much my husband and I liked our loco moco bowl and loco moco plate respectively. There was hardly even a grain of rice left over to be had. This was good enough to fuel us up for our day of exploring the island of Oahu. I don’t think my husband and I could ever visit Honolulu again without making a stop at Rainbow Drive In. Everyone should put this Hawaiian institution on their “must eat” list when visiting for great, authentic Hawaiian plate lunches. It was really good! I still think this is the perfect after-hiking food, and I wish I could’ve had it after our hike like I originally tried to do. But I’m glad I got to have it when we did. I ate mine more compartmentalized, too, but I liked it that way. Not sure if it was Greg’s fave, but he knew that going in, and tried it anyway. He has only recently begun eating eggs at all. I would definitely get it again if I go back to Hawaii.